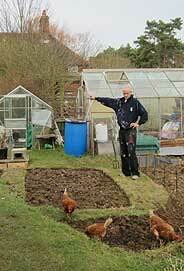 In the sense of self sufficiency and self reliance, Chickens and a Vegetable Patch go well together. In every other Department, it's touch and go to say the least, suddenly you find that security wise, the Chicken is no longer the Prey, it's the Predator! When actually preparing a Vegetable Patch or indeed when winding things up at the end of the growing season, your Hens can be very efficient little workers, they'll rummage and scrape through all your turned over soil, find all the little creatures, a few slugs maybe, eat a few weeds (especially Dandelions) and leave a few Poos to fertilize the soil for good measure. The problem is that if when you have actual living and active vegetables in the Patch, the sure fire way to find out what is a weed and what is an edible Vegetable is to see what's left after they've been there......all that remains will more than likely be the Weeds! Fencing around the Chicken Run is for two reasons; to keep your Chickens in and to keep Predators out. In this sense a fence around a Vegetable Patch is definitely keep them out and should be fixed and as effective as the Run. I once tried putting the plastic fencing they use around holes in the road. I carefully put posts in and efficiently encircled the whole area. Great, not, they simply slipped underneath and before I knew it half the Sprouts had gone! Give a Chicken a Sprout on it's own, it won't take much notice, attach it to it's stem, they'll love it! So, what sort of Fencing can we put around parts of the Garden we want to protect without making it look too much of a mess and an expensive one at that! My Growing area is around 25feet square, so that's 100 feet of fence plus a gate. In most cases this would require a longer fence than your Run itself. You could still go down the plastic netting type route, but be sure to embed it into the ground. Also, be aware that it tends to sag and a Chicken will get over it quite easily. Add to that if you're not around a Hen get's entangled in it, it probably wouldn't last long, I've had the horrible experience of finding a Hen which had got stuck obviously trying to go through a little gap and I kicked myself for weeks because I hadn't noticed the risks. 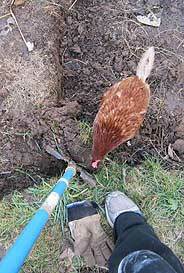 Basically, it's going to need more than that, so I would go down the four / five feet high Chicken Wire route. It doesn't need to be as thick as a Run fence as the Chickens will not have the bite a Fox has. The other way would be electric, but if you had the same size Patch as me, that would amount to over three figures £ wise. We have to remember that by keeping Hens in the Garden and growing our own, we are effectively creating a kind of Home Farm, a working Garden and a means for our own food and sustainable benefit, they are separate parts of our set up and for most of the year, have to be kept separate as well. I'm lucky, I have a Run the same size as my Vegetable Garden so I tend to only let my Chickens in the Garden itself from mid September to March, they have sufficient vegetation and creepy crawlies in there to keep them quite content, but it is something special to see them roaming as free as you can allow it and be sure they're safe in doing so. The good news about all this is that they all work off each other - the veg wastage is boiled up as food for the Hens, they eat it, they poo it and it goes back into Compost to keep the whole cycle going. I call it Garden Farming, it's our bit of the past, our way to escape the modern methods, find our skills, produce food knowing where it's come from and enjoying a simpler lifestyle. Training your Chickens to leave is not an option!